While the Hungarians were still retreating in the autumn of 1848, Engels wanted to mobilize the public in his newspaper in order to protect “the greatest man of the year 1848”. In April 1849 he already praised the Magyars’ “well organized and superbly led army”, calling Generals Görgey and Bem “the most gifted commanders of our time”. At the same time Engels (as well as Marx) expressed his contempt for the Czechs and above all the South Slavs—the Serbs, Croats and Slovenes, who were “nations lacking history”. The Austrian South Slavs were nothing more than the “ethnic rubbish” of a complicated “thousand-year evolution”. Since the eleventh century they had lost “any semblance” of national independence, and were “torn tatters” dragged along by the Germans and Magyars. During that spring, despite the splendid victories achieved by the Hungarian troops led by Görgey, Bem, Klapka and other talented officers, and the liberation of all of Transylvania and most of Hungary, the inevitable catastrophe—the intervention of Russia—was fast approaching. By March that intervention had already been agreed upon as the Austrian government proved unable to master the situation on its own. This was the natural consequence of the cooperation between the Habsburgs and the Romanovs, which had become even closer since the defeat of the Polish Revolution of 1830–1. It was thus not Kossuth’s Declaration of Independence that had prompted the invasion. He received me exceptionally graciously and cordially, and at 4 o’clock I dined with him tête-à-tête. We travelled very fast, and the Russian railways are especially outstanding for their good organization and smooth ride. Altogether everything is so pleasantly orderly and calm here. The question is often raised whether the Austrian state in that situation, without Russian aid, would have been able to defeat the Hungarian uprising, which, after its unexpected successes in the spring of 1849, grew so rapidly and became so immense. […] In order to attain a decisive military superiority, which was also assured in all aspects of foreign relations, the Russian armed intervention was indispensable in Hungary and Transylvania. The mighty and imposing aid of a Russian army would inevitably lead to success, and result in the establishment of peace in Austria and the whole of Europe, even if Austria’s performance were less energetic and successful. The Austrians kept inadequate records, the Hungarians kept almost none. It seems that about 50,000 Hungarians died and about the same number of Austrians. The Russian expeditionary forces lost only 543 killed in battle and 1,670 wounded. On the other hand. Paskevichs army buried 11,028 cholera victims. In the event Russia’s intervention sealed the fate of Hungary. Against 194,000 Russians and 176,000 Austrians with a total of 1,200 artillery pieces, the 152,000 honvéds (according to some estimates 170,000) with 450 field-guns did not stand a chance. Yet the fighting lasted until August. The Hungarians were totally isolated. Kossuth and his Prime Minister Szemere addressed a desperate appeal to the peoples of Europe: “Europe’s freedom will be decided on Hungarian soil. With it world freedom loses a great country, with this nation a loyal hero.” Even Kossuth’s emissaries in London and Paris, Count László Teleki and Ferenc Pulszky, both with excellent social connections, could achieve nothing. As so often before and after in Hungarian history (from 1241 to 1956), no European power lifted a finger in the interests of the Magyars. Lord Palmerston, for example, never wavered from his belief in the necessity of preserving the Monarchy’s integrity. Even though in Parliament he publicly declared himself disturbed by the Russian intervention, in a personal conversation with the Russian ambassador in London he expressed the hope that the Tsar’s army would act swiftly. Paskevich, Haynau and Jelačić attacked the Hungarian units from all sides, forcing them back into the far south-eastern corner of the country. Until that time the deputies still held their meetings in the National Assembly in the southern city of Szeged, and on 28 July they crowned their work with two significant and symbolic enactments on the equality of nationalities and the emancipation of the Jews. The Nationalities Law was passed after Kossuth had negotiated in July with the Romanian liberal intellectual Nicolae Balcescu, and Serbian representatives over the possibility of reconciliation and co-operation. Although Law VIII of 1849 reinforced Hungarian as the official language, it also envisaged the free development of all ethnic groups: every citizen had the right to use his own language in his dealings with the authorities; the majority would determine the language to be used in local administration; and primary schools would use the local language. The bill for the emancipation of the Jews provoked no debate. The government and deputies recognized the community as equal; it had stood by the nation with 10,000–20,000 volunteers and numerous officers in the honvéd army and made donations for weapons as loyally as the Christian Hungarians. After the war the Jews paid a high price for the public avowal of their Hungarianness; some of their leaders were arrested, and some communities had to pay colossal fines. Barely a fortnight later the dream was over. After defeats at Szeged and Temesvár Kossuth abdicated and fled, disguised as the butler of a Polish nobleman. He shaved off his distinguishing beard, changed his hairstyle and, armed with two passports, one in the name of a Hungarian (“Tamás Udvardi”) and an English one in the name of “James Bloomfield”, took off for Turkey. On August 11 he had already transfered full military and civilian authority to Görgey, the Minister of War, who—as Head of State for a day—surrendered to the Russians at Világos near Arad with his shrunken army of eleven generals, 1,426 officers and 32,569 other ranks, with 144 field-guns and sixty battle flags. Whether Görgey’s preference for laying down his arms before the Russians and not the Austrians goaded the Austrians to even more appalling retribution against the revolutionaries is a moot question. 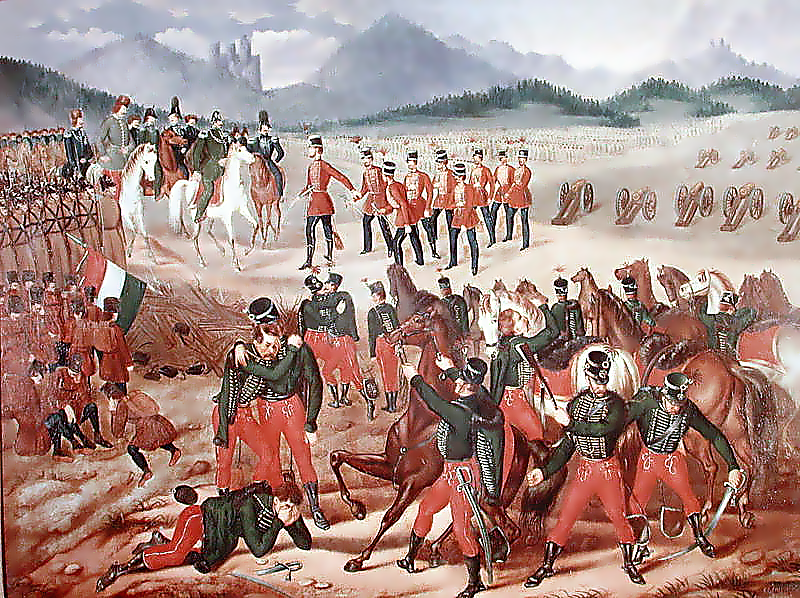 The surrender at Világos marked the end of revolution in the Habsburg empire, which had run its course several weeks earlier when the last German republicans capitulated to Prussia. Heinrich Heine in Paris saw the collapse of Hungary as the final act in the drama of the Europe-wide Revolution: “Thus fell the last bastion of freedom….” Prince Paskevich reported to the Tsar: “Hungary lies at the feet of Your Majesty.” The Tsar exhorted the Austrians to show clemency to the defeated rebels. The young Emperor celebrated his nineteenth birthday at Bad Ischl. His mother, as always, had arranged everything beautifully: there was a large birthday cake with nineteen candles, a Tyrolean choir sang the Austrian national anthem, and the happy young man bagged six chamois bucks. Afterwards, however, Franz Joseph committed a grave error: as always, he needed the advice of his implacable Prime Minister Schwarzenberg, and on 20 August the Council of Ministers, presided over by the Emperor, determined that all the Hungarian ringleaders, from staff officers upwards, should be court-martialled. The retribution was entrusted to the infamous German General Baron Ludwig von Haynau, illegitimate son of the Elector Wilhelm I of Hesse-Kassel. He had earned himself the sobriquet “the hyena of Brescia” for his gory deeds in Italy where, after occupying the Lombard city, he ordered the public flogging of local insurgents, among them women, and the arrest and execution of a priest who was dragged from the altar. In the words of the old Field-Marshal Radetzky, “He is my best general, but he is like a razor that should be put back into its case after use.” Feldzeugmeister Haynau worked fast, without mercy and delighting in his assignment. “I am the man who will restore order, I shall have hundreds shot with a clear conscience,” he wrote to Radetzky. Originally no death penalty was to be carried out without approval from Vienna, but the Emperor and the government finally gave in to Haynau’s urging; it would suffice to announce the executions retrospectively. On 6 October 1849, the anniversary of Minister of War Latour’s murder, thirteen generals of the Hungarian revolutionary army were executed in the fortress of Arad. A fourteenth former officer of the Imperial army was also condemned to death as a Hungarian general, but at the last moment his sentence was commuted to life imprisonment. The thirteen heroes of the Revolution, whose anniversary is annually commemorated in Hungary, included a German of Austrian origin, a German-Austrian, two Hungarian-Germans, a Croat, a Serb from the Bánát and two Hungarians of Armenian origin. Not all the five “pure” Hungarians were familiar with the Hungarian language. Six civilians were executed in Pest, among them the moderate former Prime Minister of Hungary, Count Lajos Batthyány. He had stabbed himself in the neck with a dagger smuggled into the military prison by his sister-in-law and, although army doctors saved his life, it was impossible to hang him and he had to be shot despite the terms of the original sentence. On Haynau’s orders 2,000 officers and civilian patriots were imprisoned, and 500 former Habsburg officers, including 24 Imperial-Royal generals, were court-martialled, and about forty officers (though no more generals) were executed, while most of the others were condemned to years of imprisonment in chains. The total number of executions has been estimated at 120. To the enduring shame of the Schwarzenberg government even the intervention of the czar for the brave Hungarian commanders was rejected… The action of the Schwarzenberg government and its henchmen stands in contrast to Grant’s generous attitude toward the officers of the South after the surrender at Appomattox in the American Civil War. Schwarzenberg managed to unite English, French, German, and even Russian feelings in common revulsion against him and Haynau, who was publicly insulted during his subsequent “goodwill” visits to Brussels and London. Haynau soon became intolerable to the Court as well, and was pensioned off in 1850. Strangely he bought an estate in Hungary and was even outraged that the “New Landowner” (as he was caricatured in one of Jókai’s novels) was shunned by the other landowners. He died, supposedly insane, in 1853. The other principal character on the Imperial side, Ban Jelačić, lived on for a few more years, but also mentally deranged. As a disappointed Croat patriot he had given up on his cause; the Austrian government kept only very few of the promises made to the Croats. Each historical turning-point influenced the Jelačić myth. Thus in 1866, before the settlement between Hungary and Croatia, an equestrian statue was erected to him in the main square of Zagreb, pointing his index finger towards the north in the direction of Hungary. Eighty years later, in 1947, the statue was dismantled and the place renamed “Square of the Republic”. After the rebirth of Croatia in 1990, the government restored the statue, this time with the index finger pointing south, i.e. towards neither the long-forgotten Hungarian enemy nor the new arch-enemy Serbia. The place is once again called “Ban Josipa Jelačić square”.